Packed with the latest Toyota performance and safety technology, All-New Corolla Hatch Ascent Sport is leading the way to a bolder, more exhilarating drive. From advanced displays to heated seats, All-New Corolla Hatch's class-leading technology represents decades of hard-won expertise and an intolerance for the ordinary. With the myToyota app, you can book a service, check your vehicle info and redeem exclusive rewards. We've got the parts, accessories and know-how to help keep your Toyota in peak condition. Advanced displays, including a Head-Up Display on Corolla Hatch ZR, puts the information you need in easy view, so you can focus on the road ahead. To view more today check out The All New Corolla. [B2]Pre-Collision Safety system with Pedestrian Detection and Cyclist Detection is a driver assist feature only and not a substitute for safe driving practices. Driver remains responsible at all times for safe driving. Pedestrians may not be detected in certain conditions including low and harsh light, where partially obstructed from view, where clothing or movement obscures or effects body contours, persons under 1 metre or over 2 metres tall and where carrying or pushing large objects. [B37]Pre-Collision Safety system with Pedestrian and Cyclist Detection is a driver assist feature only and not a substitute for safe driving practices. Driver remains responsible at all times for safe driving. Pedestrians and cyclists may not be detected in certain conditions. Pedestrians may not be detected including in low and harsh light, where partially obstructed from view, where clothing or movement obscures or effects body contours, persons under 1 metre or over 2 metres tall and where carrying or pushing large objects. [B38]Lane Trace Assist is a driver assist feature only, designed to operate when certain technical conditions are met, and is not a substitute for safe driving practices. Driver remains responsible at all times for safe driving. [B39]Road Sign Assist is a driver assist feature only, designed to operate when certain technical conditions are met, and is not a substitute for safe driving practices. Driver remains responsible at all times for safe driving. Recognises road speed signs only. [B9]Active Cruise Control is a driver assist feature only and is not a substitute for safe driving practices. Driver remains responsible at all times for safe driving. [C8]JBL® is a registered trade mark of Harman International Industries, Incorporated. [F7]Terms and conditions apply. 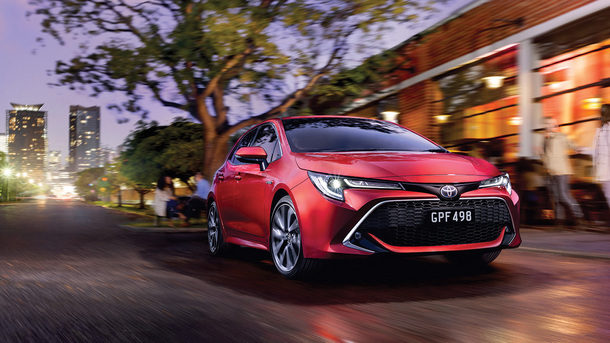 Before making a decision about this product please read the current Product Disclosure Statement (PDS) available from participating Toyota Dealers, via our website toyotainsurance.com.au or by calling 137 200. Toyota Insurance is issued by Toyota Finance Australia Limited ABN 48 002 435 181, AFSL and Australian Credit Licence 392536. The insurer is Aioi Nissay Dowa Insurance Company Australia Pty Ltd ABN 11 132 524 282 AFSL Number 443540. Our insurance policies do not change or take away your rights under the Australian Consumer Law. Your right to claim under our policies for the benefits covered are in addition to other rights and remedies you have under the law in relation to your vehicle. However, you can choose to make a claim under any of our policies even if you have rights under the law. [M6]For Corolla and Corolla Hybrid with production month after June 2018. Maximum payable for standard scheduled logbook servicing (normal operating conditions) for a 12months or 15,000 kilometres (whichever occurs first) up to a maximum of 5 years or 75,000 kilometres.